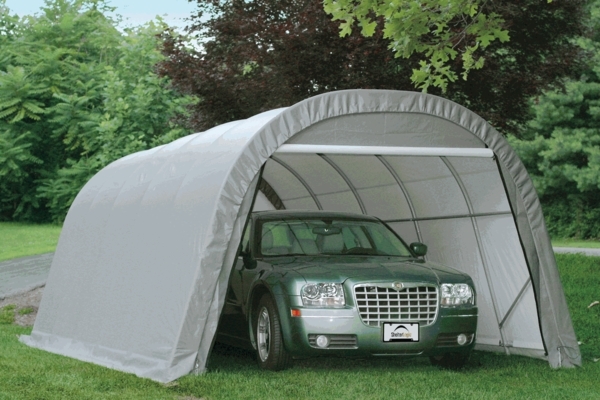 This practical portable garage canopy is the best way to protect your vehicle. The sturdy beam welded 1-5/8" diameter 17 gauge steel frame is field tested to withstand nearly all weather conditions. The high grade steel frame goes through a 13 step surface preparation process. The wide based foot pads on every leg allow for a dependable sturdy base. The baked on powder-coated finish eliminates any rust, weathering, chipping, or peeling. The heat bonded, triple layer, polyethylene cover has enhanced weave to ensure that it is 100% water proof. Use this UV treated portable garage to protect your valued possession. 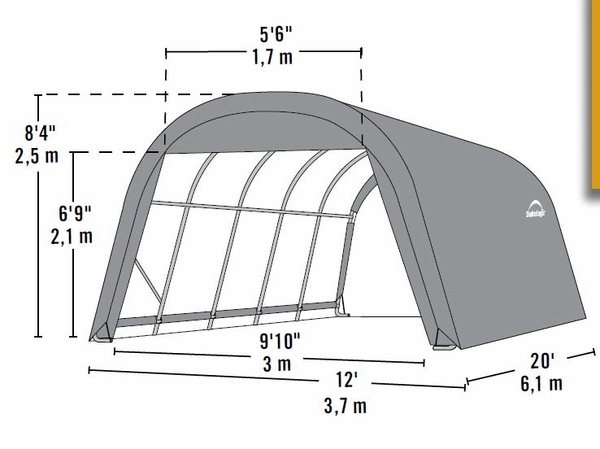 Our canopy is snow damaged and I need to replace the broken connectors and corners. Where can I get those from? You will need to contact Shelter Logic directly. Pros - it does provide a large storage area that will hold a SUV. ConsBig installation process. Awning will probably rip in the wind. No front door access to allow easy entry and exit. ProsIt assembled without a lot of trouble. Just read forward in the directions so you don't have to do things twice. ConsThe canopy part looked like it was resting on screw heads for a long time. the result was light spots or thin spots once the shelter was up which might end up as leaks. it took my wife and I about 4.5 hours to fully install this round top. The footprint is actually 13' x 20'. the unit seems pretty sturdy. You definitely want to erect this on a low wind day. and get some extra anchoring system. But so far we are happy with the structure and it feels very solid. The design is smart and the tension system of the canopy is pretty slick. Make sure everything is square and think ahead. The instructions or not the quickest way to erect this structure, but they may have them that way for liability reasons. We erected the top half first then moved it to position, then added one side of the legs and lifted the frame up to slide the other legs in and anchored it down. Then we added the canopy ends then top and installed the lowers and bolted them together. we also laid a tarp down on the floor on the inside to reduce some of the ground sweat moisture building up. we'll see....but other than needed to drill out a few of the pre-drilled holes, it's a pretty easy system. Took many hands.and about 6hours plus seeing one already installed to complete set-up. Wish there was straps to hold doors open when not being used. will have to put velcro(heavy-duty) totry tokeep doorsopen. So far,assembly took4adult males 3 1/4 hours to assemble accord.to directions.Have to resched. to apply garage cover as now must disassemble base section by section to slide tubing through slots to attach cover to frame.more complex than exp.ected. Hope team can resched.before weather changes.